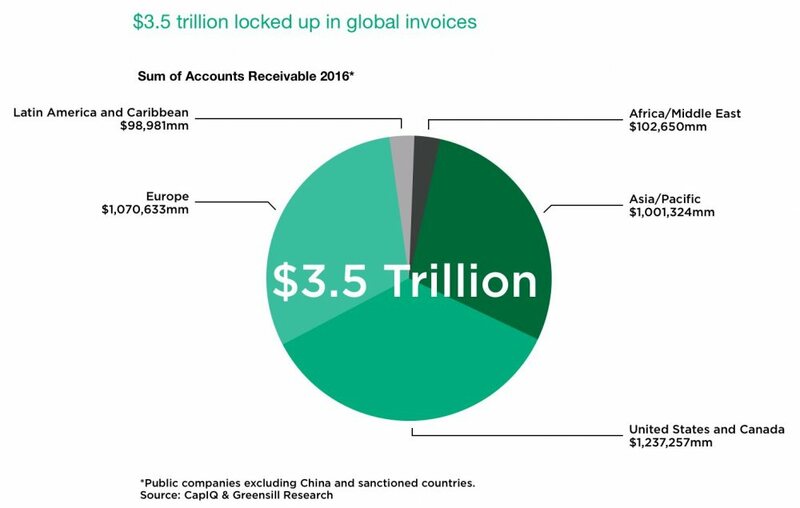 More than $3.5 trillion of cash is locked up in working capital around the world at any one time in what is perhaps one of the greatest inefficiencies to perplex chief financial officers, accountants and treasurers in commercial history. That huge pile of cash, caught in a deep and complex web of Supply Chains between buyers and sellers, is also one of commercial history’s greatest misnomers for this working capital isn’t working at all. Imagine if businesses around the world, from the smallest SMEs to the largest multinationals, could unlock that capital and put it to work. What would your business do if someone could liberate just a fraction of that $3.5 trillion on your behalf? 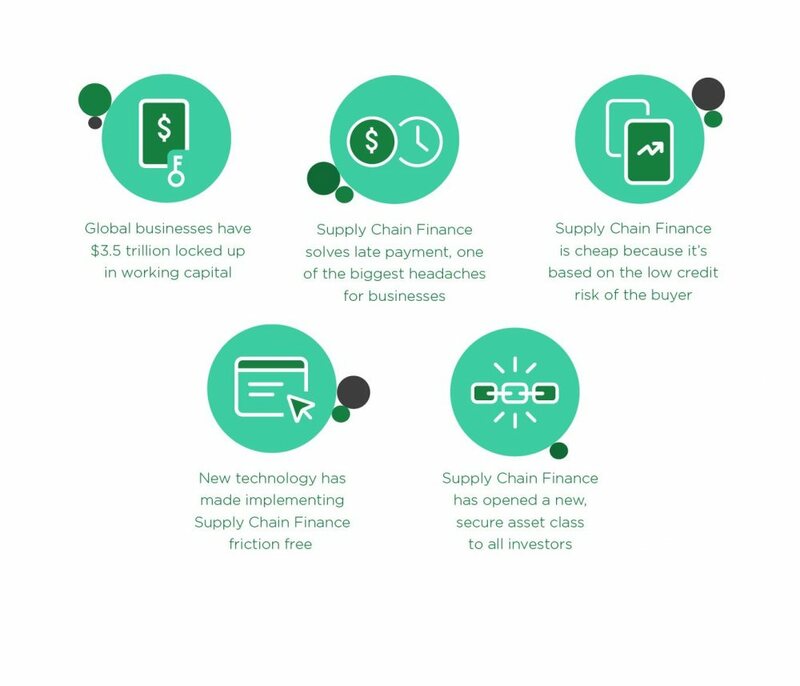 Supply Chain Finance, which in its purest form provides early payments to suppliers of all stripes and sizes, frees that money to finance growth and investment at every step in the Supply Chain. At its most innovative, Supply Chain Finance has helped telecoms companies fund their handset inventory, industrialists to finance the latest in renewable energy technologies and airlines purchase fleets of passenger jets to open the skies to a new generation of travellers. Rather than waiting months to be paid, Supply Chain Finance allows suppliers to get paid immediately, especially if the customer who owes them money for goods and services is a large company with a good credit rating. In this case a financier will apply the buyer’s credit rating to the supplier on the basis that the chances of default are very small, allowing the financier to extend credit on very reasonable terms—much lower than normal lending rates. Supply Chain Finance is good for suppliers. They get paid early and can do all the things they need to grow like buy inventory, keep up with new orders and offer credit to their own supplier network. And it’s good for the large corporate or multinational buyers as they gain extra time to pay suppliers and can hold on to valuable working capital a little longer. "Supply Chain Finance is the solution to late payment, one of the biggest headaches for businesses all over the world." Companies, particularly small ones, bear a constant risk of late payment for their goods and services, crimping their ability to grow and invest. In the UK alone, some £266 billion of small and medium-sized business turnover is locked up in late payments from suppliers, the equivalent to 15 per cent of average annual turnover. In the US, more than a quarter of respondents to a recent survey by Bibby Financial Services said they were paid late; a quarter said they were unable to recover money owed at all. Paying late hurts big corporates, too. The working capital advantages a company gains by pushing out payment terms is short-lived if their suppliers push up prices. Big companies depend on a vibrant, healthy Supply Chain, but late payment causes suppliers to lose confidence in that relationship or, at the worse, fold. When word got out that “Toys R Us” was in trouble before Christmas 2017, many suppliers stopped shipping products or demanded cash on delivery at the busiest time of the retailer’s year. Supply Chain Finance is much more efficient and much cheaper than other forms of finance, such as taking on debt. By leveraging the strong credit rating of the corporate buyer, suppliers gets access to their cash at ultra-low rates, enabling non-investment-grade suppliers to benefit from investment-grade financing rates. At Greensill, a leading supplier of structured finance solutions including Supply Chain Finance, rates are around 1 percent. Greensill keeps the process friction-free, easy to implement and easy to run using the latest technology and, significantly, employing a solution using capital markets. The firm buys hundreds of thousands of invoices, or trade receivables, from companies wanting to get paid early every day. It packages them into short-term, buyer-backed bonds and sells them to investors. In fact, Greensill is one of the most prolific bond issuers in the world, issuing about 26 bonds every business day of the year. The whole process is underpinned by Greensill Bank, the company’s own finance house based in Bremen, Germany, and the world’s first Supply Chain Finance investment fund, which is co-run by Greensill and GAM and currently has more than $3 billion under management. Supply Chain Finance is an increasingly popular asset class in today’s low-yield environment, and it is low-risk. No investment-grade corporate has defaulted on its promise to pay suppliers in the last 20 years. Supply Chain Finance is nothing new; banks have been offering it since the 1990s. But their appetite to lend has been dampened by new regulation introduced after the financial crisis. Since then, banks have had to increase their capital ratios and reduce risk, and many have scaled back their short-term trade finance programmes to only their largest, blue-chip clients and their top-tier suppliers. And because cash-strapped banks have struggled to introduce new technology, traditional Supply Chain Finance is time-consuming, paper-heavy and costly. Specialist financial firms like Greensill have changed the game by rolling out new technology that transforms the old Supply Chain Finance processes. Now companies can pay their suppliers early via new platforms and software with a click of a mouse. It’s transformed Supply Chain Finance into a frictionless process that runs silently in the background to optimise any company’s balance sheet. The global Supply Chain Finance market grew 70 per cent between 2012 and 2014 and is forecast to continue to grow 25 to 30 per cent a year. In that time non-bank providers have already grabbed an estimated 10 to 15 percent of the market from banks, according to the consultancy McKinsey. More big companies are waking up to the benefits of boosting their working capital at the same time as helping their suppliers with Supply Chain Finance. Around half the companies in the S&P 500 now use some form of Supply Chain Finance, including household names like Procter & Gamble, Rolls-Royce, Coca-Cola and Vodafone. Governments are also taking notice, which is evident in policy initiatives, particularly in the US and UK in support of Supply Chain Finance. The benefits of Supply Chain Finance are many, whether your company is a supplier, a buyer or has cash to invest. One thing, however, is certain: deploying the tools, technology and techniques of modern Supply Chain Finance will enable your company to unlock its part of that $3.5 trillion of working capital so you can put it to work.